This portrait depicts the artist's only child, Antoinette, who was one of his favourite models. It is one of three portraits George Bell painted in London, and is a preliminary work for the final portrait held in the National Gallery of Victoria. 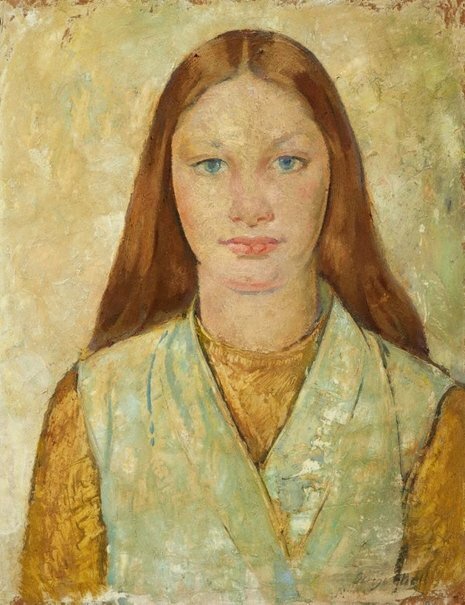 Bell travelled to England in 1934 to absorb new approaches to painting, motivated by his interest in modern art and growing dissatisfaction with the stagnation of the Australian art scene. His work from this period reveals certain stylistic changes, a consideration of line and form, and an increasing emphasis on colour. These developments, and Bell's exposure to the work of Modigliani, are particularly evident in 'Toinette'. Signed and dated l.r. corner, green oil "George Bell/ .../ 34". Basil Burdett, The Studio , 'Australian art today', pg. 15, London, Jan 1938, 15 (illus.). NOTE: 'The Studio' was the international edition of the journal, published in London. 'The London Studio' was the New York edition, published in New York. The same article appeared in 'The London Studio', vol. XV, no. 82, page unknown. Basil Burdett, Art in Australia [series 3, no. 73] , 'Modern art in Melbourne', pg. 46, Sydney, Nov 1938, 46 (illus.). Art and medicine: reminiscences & reflections of a retiring surgeon , 'Postlude', pg. 79-87, Melbourne, 1999, 84 (colour illus. ), 84. Felicity St John Moore, Classical modernism: the George Bell circle , Melbourne, 1992, 4. A colour illustration of the National Gallery of Victoria version is reproduced on the same page.